BACKGROUND AND PURPOSE: The connectivity across brain regions can be evaluated through fMRI either by using ICA or by means of correlation analysis of time courses measured in predefined ROIs. The purpose of this study was to investigate quantitatively the correspondence between the connectivity information provided by the 2 techniques. RESULTS: A strongly significant correspondence of moderate intensity was found for 20 ICA components (r = 0.44, P < .001). Repeating the analysis with 10, 15, 25, 30, 35, and 40 components, we found that the correlation remained but was weaker (r = 0.35–0.41). CONCLUSIONS: There is a significant but not complete correspondence between the results provided by ICA and ROI−based analysis of resting-state data. Functional connectivity can be investigated through fMRI by means of a range of methods that detect time course coherencies in the BOLD signal intensity across brain regions during the performance of active tasks and in the resting condition.3,4 The study of resting-state functional connectivity is important from 2 perspectives: First, it provides information on the spontaneous activity that is intrinsically generated within the brain, which subserves communication across regions; and it provides integration of information, memory consolidation and introspection, and overall consumes more energy than stimulus-evoked activity.5 Second, resting-state fMRI may be the only form of functional imaging viable in cognitively impaired patients who are unable to perform active tasks adequately. There are 2 distinct methodologic approaches for studying functional connectivity through fMRI: One is to perform a completely data-driven analysis, for example, through ICA; the other is to rely on prior anatomic hypotheses to restrict the analysis to a predefined set of ROI or to a specific seed region. The alternative approach, ROI−based analysis, is based on a priori selection of regions, followed by extraction of regionally averaged BOLD signal-intensity time courses, which are fed into a linear correlation analysis. ROI−based and seed-based analyses are conceptually equivalent in the sense that they both infer connectivity from the temporal correlation of regional BOLD time courses, even though they are differentiated by the fact that ROI−based analysis compares regionally averaged signals over pairs of ROI (eg, Wang et al16), whereas seed-based analysis compares the regionally averaged signal intensity from 1 seed ROI with that of all other individual voxels of the brain (eg, Cordes et al17). In principle, ICA and ROI−based analysis should lead to similar inferences because both index the same underlying connectivity. However, in practice, the 2 methods process the time-series in very different ways, and there are several reasons that they may not provide overlapping information. For example, let us consider 2 hypothetic ROI having strongly correlated BOLD signal-intensity time courses. If their common time course corresponds to 1 independent component or to the sum of a small number of independent components, then the 2 regions will appear coactivated on 1 or more ICA spatial map. If, however, the common time course is the combination of a large number of independent components, then it is likely that the activation of these 2 regions will not reach statistical significance on any individual ICA spatial map. Evaluating the degree to which ICA and ROI−based analysis leads to analogous inferences on connectivity appears necessary as a validity check. 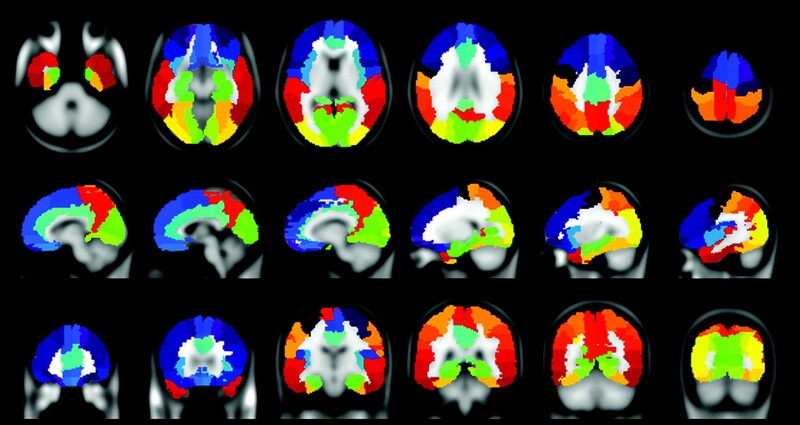 A number of neuroimaging studies have shown that these 2 methods yield converging results19–24: For instance, the studies by Bluhm et al20 and Long et al21 have indicated that these 2 approaches identify the areas included in the DMN consistently, resulting in connectivity maps that are visually similar. Van Dijk et al24 have examined the similarities between the 2 methods with a more quantitative analysis, albeit for 1 functional network only, showing that the correlation between ICA and the seed-based approach is moderate for the DMN (r = 0.45). However, existing literature is lacking a comprehensive quantitative evaluation of the extent to which the results obtained with the ICA and ROI−based analyses are consistent at the level of a whole dataset rather than a specific circuit. In this study, we addressed this issue, assessing quantitatively the degree of correspondence between the functional connectivity information provided by ICA and ROI−based analysis, in a group of healthy participants in a resting-state condition. As ancillary hypotheses, we aimed to determine whether the correspondence 1) was influenced by the number of components used for ICA, 2) was sensitive to the choice of the ICA coactivation index formula (see below), or was 3) specifically driven by a few intensely coactivated regions and specifically driven by particular combinations of regions. To this end, we included a large number of regions of interest (38 for hemisphere) because we did not want to limit our analyses to a predefined set of regions. Forty right-handed healthy volunteers (21 women and 19 men; mean, 40.8 ± 9.3 years of age) with no history of neurologic or psychiatric disease participated in the study. The purpose of the experiment was explained at enrollment, and all participants, unpaid, provided written informed consent on standard institutional forms for research MR imaging. Participants were instructed to keep their eyes open, fixate on a cross centered on the screen, and relax, concentrating on their own breathing. MR imaging was performed on a Magnetom Avanto 1.5T scanner (Siemens, Erlangen, Germany), by using an 8-channel phased-array receive-only head coil. Anatomic images were acquired with a magnetization-prepared gradient echo volumetric T1-weighted sequence (magnetization-prepared rapid acquisition of gradient echo, 1-mm3 isotropic voxels, TR = 1640 ms, TE = 2 ms). Two hundred functional volumes were acquired by means of a gradient-echo echo-planar sequence (TR = 1700 ms, TE = 50 ms); twenty-one 5-mm sections were obtained in interleaved order, aligned parallel to the bicommissural plane. In-plane voxel size was 2 × 2 mm, with a matrix size of 160 × 256. The duration of the functional sequence was approximately 5 minutes. Image preprocessing was performed by using SPM5 software (Wellcome Department of Imaging Neuroscience, London, UK) running under Matlab 7 (MathWorks, Natick, Massachusetts). After realignment with 6 degrees-of-freedom and section-timing correction, functional images were coregistered with the corresponding anatomic volumes and subsequently transformed into Montreal Neurologic Institute space. Maximum intrasession head movement was 0.5 ± 0.4 mm (range, 0.2–2 mm) across participants. Smoothing was, thereafter, performed with an 8-mm full width at half maximum isotropic Gaussian kernel. Examples from a representative participant of the subdivision of the cortex into the AAL atlas ROIs used for the connectivity analysis.29 The full list of ROIs is given in the On-line Table. The BOLD signal-intensity percentage change was calculated and averaged over all voxels in each region of interest. An individual binary mask produced by SPM was used to remove all nonbrain parenchyma voxels.24 The average time course calculated over all brain voxels was subtracted from the data, because this is the major criterion to remove artifactual inter-regional correlations caused by the biasing effect of non-neural brain-wide signal-intensity fluctuations.30 Furthermore, low-pass filtering with a second-order Butterworth filter having f−3dB = 0.15 Hz was applied to attenuate non-neuronal noise. Then, we performed linear regressions to obtain the correlation coefficient for all possible pairs of regional time courses, resulting in a 76 × 76 symmetric matrix of Pearson r values for each subject, subsequently averaged over all subjects. Since ICA analysis does not embed temporal filtering, we repeated these analyses on unfiltered data to verify the effect of the chosen filter settings on the observed correspondence. where 〈ti,A〉 and 〈ti,B〉 represent the average group-level t-scores in regions of interest A and B, and i=1… m corresponds to the summation over all extracted components. As implemented in GIFT, the group-level t-scores are derived from 1-sample t tests performed over the individual β coefficients of the general linear models used to generate the component maps from the time courses extracted by ICA. In this process, all estimated components were included and no thresholding was applied to the ICA maps. The purpose of this index was to provide a metric resembling a correlation coefficient (albeit unbounded) but calculated on the basis of the ICA spatial maps rather than the regional BOLD signal-intensity time courses. The first calculation step (ie, multiplication of the average t-scores of the 2 regions of interest) ensured that for a given spatial map, the coactivation index would be positive for regions commonly correlating (or anticorrelating) within the ICA component map, negative for regions displaying opposite correlations, and near zero if either or both regions of interest were uncorrelated with the component time-series. The second calculation step (ie, summation of the products over all ICA components) ensured that all component maps contributed to determining the overall value of the coactivation index for a given pair of regions of interest. For k = 1, we have the original equation. For k > 1, the relative weight of intense coactivation of a small number of regions is increased with respect to that of less intense coactivation of a larger number of regions. For k <1, we have the converse effect. Evaluating the correspondence between the 2 techniques, we performed a correlation analysis at group level between the r values from the ROI analysis and the ICA coactivation indices. This was done by using both a linear correlation analysis and a nonparametric Spearman rank-order test and was repeated for 10, 15, 25, 30, 35, and 40 ICA components. For this test, diagonal entries (corresponding to each region compared with itself) were removed. Furthermore, to explore whether the correspondence between the 2 techniques was driven by specific regions, we performed an ANOVA on the average rank distance (as calculated during the Spearman rank-order test, where zero indicates equal and 1, the opposite position on the 2 sorted lists) by using ROI location as a factor. We also calculated the mean and SD of the time course r value for each pair of regions of interest across subjects and following Cohen's criteria,31 correlations were considered small (r < 0.3), moderate (0.3 < r < 0.5), or large (r > 0.5). Representative sections of the ICA spatial maps obtained by performing the decomposition with 20 components are shown in Fig 2. All components extracted by the decomposition are displayed. Overall, these maps display the connectivity patterns that have been previously described.13,14,28 For example, components 2 and 3 exhibit lateralized activations in the frontal and parietal regions. Component 5 encompasses the medial prefrontal cortex, anterior and posterior cingulate, precuneus, and angular gyrus, which are collectively known as the DMN. Component 9 includes activations in the pre- andpostcentral gyri and the supplementary motor area, corresponding to the sensory-motor network. Component 14 involves the superior temporal, insular, and postcentral cortices, which are acknowledged to form an auditory network. Component 19 involves the frontal polar, middle frontal, and anterior cingulate regions and has been linked to the executive-control component. By contrast, activation in component 16 closely follows the outline of the ventricles, demonstrating that it is physiologically determined, namely by cardiac-induced pulsation of the CSF. In addition, component 6 includes speckles following the brain outline, likely representing movement-related noise. 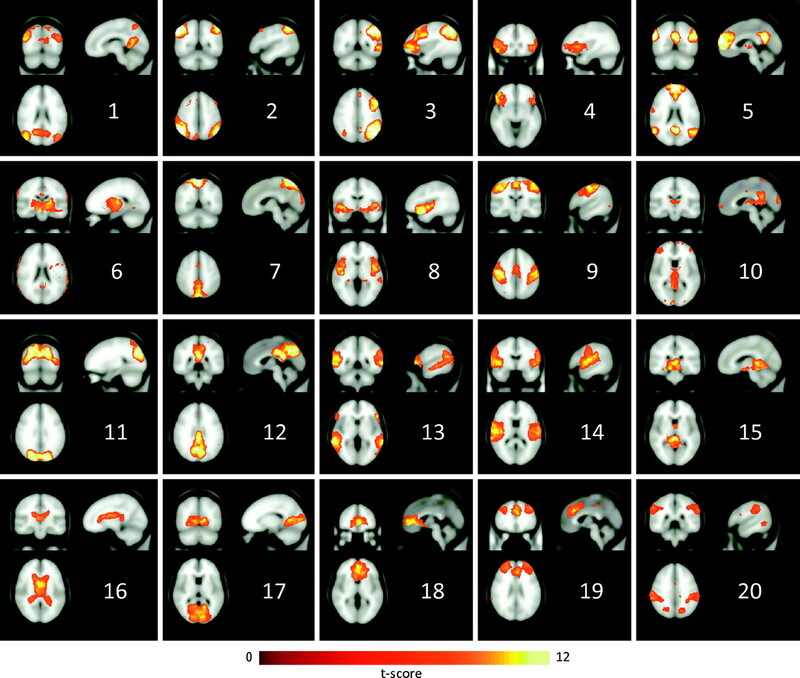 Coronal, sagittal, and axial views of the ICA spatial maps estimated by GIFT, considering 20 components. The mean r value was 0.08 ± 0.22 (range −0.44–0.85), with 59% positive r values; for unfiltered data, >99% of r values were positive, yielding an average r value of 0.33 ± 0.18 (range, −0.02–0.89). According to Cohen criteria, for filtered data the time course correlation was small (r < 0.3) for 83% of region-of-interest pairs, moderate (0.3 < r < 0.5) for 10%, and large (r > 0.5) for 7%. For each ROI, the relative number of other ROIs displaying a time course correlation with r > 0.3 and r > 0.5 is given in the On-line Table. Overall, regions belonging to the DMN had significantly higher scores than the rest (P = .004). For 20 components, the correspondence was moderate, according to the linear correlation analysis (r = 0.44, P < .001) and to the corresponding Spearman rank-order tests (r = 0.39, P < .001). As depicted in Fig 3A, repeating the analysis with 10, 15, 25, 30, 35, and 40 components, we found that the correlation remained but was weaker, according to both parametric and nonparametric tests. Performing the correspondence analysis on unfiltered data led to lower r values but otherwise overlapping results: The correlation between the 2 methods was strongest for 20 components with both parametric and nonparametric tests (r = 0.36, F = 449.7, P < .001 and r = 0.32, P < .001, respectively) and weaker for all the other components. Correlation between the time course r values and corresponding ICA coactivation indices for each pair of ROIs; A, Effect of the number of ICs and temporal filtering and the effect of B, the power parameter k, for decomposition with 20 ICs). Figure 3B reports the results obtained sweeping the power parameter k between 0.25 and 4. The correspondence is strongest for k = 1 and decreases for both k > 1 and k < 1. The effect is more marked for the parametric test, due to deviation from normality with increasing power. Figure 4 shows the time course r values and ICA coactivation indices, visualized as color-map matrices. The 2 matrices corresponding to filtered and unfiltered time series display analogous features; however, the average r value is markedly lower for filtered signals, due to removal of brain-wide biasing fluctuations. As expected, along the diagonal, the r values are unitary, and the ICA indices are largest, corresponding to each region correlating with itself. Furthermore, values in the vicinity of the diagonal are relatively large, for both time course correlations and ICA, in intra- and interhemispheric quadrants, representing intense connectivity between each region, its neighbors, and their contralateral homologues. The ICA- and ROI−derived matrices, however, also demonstrate a marked difference. The time course r values tend to be relatively large for regions 20–35 and 40–50, corresponding to the medial frontal, cingulate, and occipital regions, whereas no such effect is observed for the ICA coactivation indices, for which the maps show a more diffuse and scattered pattern. Color-map matrices representing the time course r values (with and without low-pass filtering and mean time course removal) and corresponding ICA coactivation indices. The x- and y-axes correspond to the indices of the anatomic region of interest (as defined in the On-line Table and shown in Fig 1). For convenience, the left and right hemisphere regions of interest have been grouped together, so the upper-right and bottom-left parts of these graphs represent interhemispheric connectivity, whereas the upper-left and bottom-right parts represent intrahemispheric connectivity. On the time course matrices (left and central), a nonzero pixel level represents significant positive or negative time course correlation, as determined by linear regression. On the ICA matrix (right), the pixel level represents the value of the ICA coactivation index (as defined in the Materials and Methods section), which measures the coactivation of 2 ROIs on the ICA component maps. These matrices demonstrate partial overlap between the correlation patterns observed with time course correlation and the corresponding ICA components. See text for full description of results. Irrespective of the number of components, the ANOVA on the average rank distance, though statistically significant (P < .001) due to the degrees of freedom (75,762-76), yielded a negligibly small effect size (ηp2 < 0.04), indicating that the correspondence between the ICA coactivation indices and the ROI–derived time course r values was only very weakly driven by specific combinations of regions. Our results reveal a correspondence between the time course correlation r values and the ICA coactivation indices, which is significant (P < .001) and moderate in intensity (r = 0.44) according to Cohen criteria. This findings is novel in that while a number of previous investigations have highlighted a convergence in the information provided by the 2 methods,19–24 they have done so mainly on the basis of a qualitative judgment. To our knowledge, this study is the first to explore the issue in a quantitative manner on a whole dataset. Incomplete correspondence is not unexpected, given the conceptual differences between the 2 methods (ie, the use of data-reduction algorithms direct extraction of temporal series from each region). Furthermore, discrepancies in the results provided by the 2 methods may also reflect different sensitivities to physiologically determined systematic fluctuations (eg, Beckmann et al13). Finally, the relative merits and differences of the 2 techniques are, in principle, independent of whether the observed BOLD signal-intensity fluctuations are due to resting-state activity or related to the performance of an active task. Indeed, 1 reason for partial correspondence between ICA and time course correlation analysis is that ICA can produce “fragmented” networks, whereby given networks of coherent activity, which would appear together in a single seed-based map, are scattered across multiple components. It has been shown that this effect is critically dependent on the choice of the number of components: As this is increased, the decomposition becomes less stable and some networks (such as the visual components) branch into clearly distinct subcomponents, whereas others apparently do not (such as the sensorimotor network).34 This effect may partly account for the decreased correspondence observed when decomposition was performed with a large number of components. We chose to define the main formula used for the ICA coactivation index through the product of the average t-scores from the 2 ROIs. We extended our main findings by exploring the consequences of this choice and have inserted an explicit power parameter, k, and swept its value to determine the effect on the observed correspondence. The intensity of the correspondence was highest for k = 1 and decreased on either side of this value. This finding confirmed that the choice of the ICA coactivation index formula (ie, considering the product of the 2 average t values rather than, for example, the square root of the product) was appropriate to represent the structure of the data. Additionally, it indicated that the observed correspondence was not especially driven by a few intense coactivations (as would be the case if it had increased with k > 1) or by many weaker coactivations (k < 1), but it was, instead, representative of a characteristic of the dataset as a whole. Furthermore, the observed correlations were not strongly driven by specific combinations of ROIs; rather, they were a primarily distributed feature of the data as confirmed by the ANOVA on rank orders. ROI−based analyses indicate that in the absence of temporal filtering, most observed regional correlations are positive. Removing the average time course and performing low-pass filtering resulted in a considerably increased number of negative correlations, a finding already reported in the literature (eg, Van Dijk et al24); however, the correspondence with ICA did not change, as seen in Figs 3 and 4. The present study has a number of limitations. First, the correspondence was assessed only during resting state. However, a recent study25 has shown that the components identified during resting state and an auditory task substantially overlapped. Second, we used a relatively long TR, leading to aliasing problems. While this limitation, in common with most studies in this area (eg, Damoiseaux et al14, Seeley et al19, Van Dijk et al24, Fox et al35), prevents spectral analysis of the data, previous studies have suggested that it does not significantly alter the topographic characteristics of the extracted components (eg, Wang et al16 and De Luca et al36). Third, due to the previous limitation and to the fact that no physiologic monitoring was performed, we were unable to identify a robust objective criterion applicable to both ICA and ROI−based analysis to reject the signal-intensity fluctuations due to cardiac and respiratory activity. Fourth, the intersubject variability in the ROI−based analysis was not characterized. However, numerous studies have shown that functional connectivity data are strongly reliable across sessions and individuals.14,21,24 Future work should evaluate how variable the correlation between the 2 techniques is at the level of individual subjects, comparing ICA decompositions and time course correlations performed in a completely separate way for each subject. We have quantified the correspondence between the connectivity information provided by ICA and ROI-based analysis. We have found a significant correspondence of moderate intensity, which was modulated by the number of components used for ICA decomposition and was most intense for 20 ICs (r = 0.44). It was strongest when the product of the ICA map t-scores was considered (ie, k = 1), and the correspondence was not driven by specific combination of regions. The 2 techniques, however, do not provide completely overlapping information, and our data alone are not sufficient to elaborate guidelines regarding which one to adopt in a given study. A plausible theoretic criterion would be to adopt a regional time course correlation analysis whenever clear anatomic a priori hypotheses are available, and ICA otherwise; however, in practice the 2 techniques are frequently used jointly. A paradigmatic example is the application of resting-state studies to presurgical mapping of the motor areas. A region of interest is typically used as an initial seed to highlight the sensorimotor component of spontaneous activity, but this is always supplemented by ICA analysis, to remove anatomic assumptions that may be misleading in the presence of gross lesions and functional reorganization.37 Another example is in the study of AD: Given that a central involvement of the hippocampus is expected, a ROI approach is well-motivated.10 However, even for this application, ICA is frequently used because it reduces the risk of missing relevant activity also in other areas due to a priori anatomic assumptions.11 If possible, the 2 approaches should be applied jointly, to obtain an independent confirmation of the findings and to support further work aimed at determining the suitability of the 2 approaches for given applications. We are grateful to 2 anonymous reviewers for useful feedback on an earlier version of the manuscript. C. Rosazza and L. Minati contributed equally to the study. Disclosures: Ludovico Minati, Ownership Interest: MR imaging−compatible monitoring technology, Details: listed inventor on 2 patents in an unrelated field. This study was wholly funded by the Fondazione IRCCS Istituto Neurologico “Carlo Besta,” Milan, Italy. The data were acquired for normative purposes until 2008. Ludovico Minati was employed and funded by the Fondazione IRCCS Istituto Neurologico “Carlo Besta,” during the initial and final phases of the study, and he was employed and funded by Brighton and Sussex Medical School between January 2009 and May 2010. Accepted after revision May 10, 2011.